How to choose Rail Pass for trip in Kyushu. Many choices for both visitors and residents in Japan. Posted on September 2, 2012 July 26, 2015 Categories Rail pass for residents, Rail pass for visitorsTags Active 65, Beppu, Hakata, Kyushu, Kyushu Mankitsu Kippu, Miyazaki, Nagasaki, Ryugakusei, Student, Yufuin, kagoshima, kumamoto20 Comments on How to choose Rail Pass for trip in Kyushu. Many choices for both visitors and residents in Japan. Nagasaki is one of the highlight in Kyushu. Kyushu is located in south part of Japan. That’s why the climate is very mild and it is very popular destination in all season. Some of the travellers may arrive/depart at Fukuoka airport or other airports and travel only in Kyushu. In this post, I would like to show you several kinds of Kyushu rail passes for both visitors and resident in Japan. It is impossible to get same deals as visitors for residents. But there are some deals for the residents too. I will tell you about the pass that anyone can purchase. Continue reading How to choose Rail Pass for trip in Kyushu. Many choices for both visitors and residents in Japan. Posted on August 16, 2012 August 19, 2012 Categories News, Rail pass for residentsTags Aso Boy!, Hakata, JR Kyushu, Kamome, Kyushu, Mizuho, Sakura, Yatsushiro, kagoshima, kagoshima-chuo, kumamoto, tsubame6 Comments on Kyushu Shinkansen 2 days unlimited ride ticket for summer vacation. Kid price is only 1000 yen for 2 days! JR Kyushu is trying to get more tourist in the last stretch of summer vacation. They will start to sell Kyushu Shinkansen 2 days unlimited ride ticket on August 20, 2012. You can ride non reserved ordinary seat of Kyushu Shinkansen and any trains on conventional lines run parallel with Kyushu Shinkansen. This is very similar to unlimited ride ticket that was sold in this past March. But it was only one day ticket and kid price is 2000 yen. This ticket gives you much better deal. Continue reading Kyushu Shinkansen 2 days unlimited ride ticket for summer vacation. Kid price is only 1000 yen for 2 days! Posted on March 18, 2012 July 29, 2015 Categories Airport Access, Kyushu Area, Fukuoka (FUK)Tags FUK, Fukuoka, Fukuoka Subway, Hakata, Tenjin90 Comments on How to access from Fukuoka airport to downtown Hakata and Tenjin. Some of you may arrive at Fukuoka International Airport (FUK) from your countries directly. You may transit at Haneda and take domestic flight to Fukuoka. I have received questions about Fukuoka airport and Hakata (博多) station. I have just visited Fukuoka airport by subway. I would like to share what I got with you. Continue reading How to access from Fukuoka airport to downtown Hakata and Tenjin. Kyushu Shinkansen 1 year anniversary 1 day unlimited ride ticket. Posted on February 18, 2012 August 1, 2015 Categories NewsTags Hakata, JR Kyushu, Kyushu, kagoshima, kumamotoLeave a comment on Kyushu Shinkansen 1 year anniversary 1 day unlimited ride ticket. This coming March 17 will be one year anniversary day of Kyushu Shikansen completion. JR Kyushu have just started to sell one day unlimited ride pass of Kyushu Shikansen between Hakata and Kagoshima-Chuo. Continue reading Kyushu Shinkansen 1 year anniversary 1 day unlimited ride ticket. JR Kyushu have been planning to operate a deluxe overnight train. According to some major newspapers in Japan, JR Kyushu seem to complete the plan. They may start to take a reservation in this coming summer. Limited Express train Midori/Huis Ten Bosch. Direct transfer from Hakata to Sasebo and Huis Ten Bosch. Posted on September 10, 2011 August 1, 2015 Categories Kyushu Area, Limited Express, Hakata, Kokura, Nagasaki, Sasebo, Saga, Huis Ten BoschTags Arita, Hakata, Huis Ten Bosch, Kujukushima, Omura line, Saga, Saikai National Park, Sasebo, Takeo Onsen, Tosu4 Comments on Limited Express train Midori/Huis Ten Bosch. Direct transfer from Hakata to Sasebo and Huis Ten Bosch. Most of Midori are serviced by 783 series. Limited express “Midori” connects the gateway city in Kyushu, Hakata with very historical port city Sasebo. Some of trains are operated with Limited Express “Huis Ten Bosch” that is most popular theme park in Kyushu. When you go to Sasebo or Huis Ten Bosch, take Shinkansen to Hakata and change these trains. Of course, these express trains can be used by Japan Rail Pass without any restriction. So let’s see the details. Continue reading Limited Express train Midori/Huis Ten Bosch. Direct transfer from Hakata to Sasebo and Huis Ten Bosch. These trains connect Hakata (博多) with Yufuin (由布院) and Oita (大分) or Beppu (別府). Yufuin is one of the most popular hot springs resort in Kyushu. This is the train that you need to take when you go to Yufuin. Of course these train’s name are named from Yufuin. “Yufuin no Mori” means Yufuin’s forest. These two trains are operated on same route and fully covered by JR Pass. But Yufuin no Mori is operated by the specialized car, KIHA-71 or 72 series. This express train is one of the best in JR Kyushu train and very very popular. So I strongly recommend to take Yufuin no Mori, not Yufu. Click this image. You will be able to understand how to read Kyushu Shinkansen tentative timetable in Japanese. 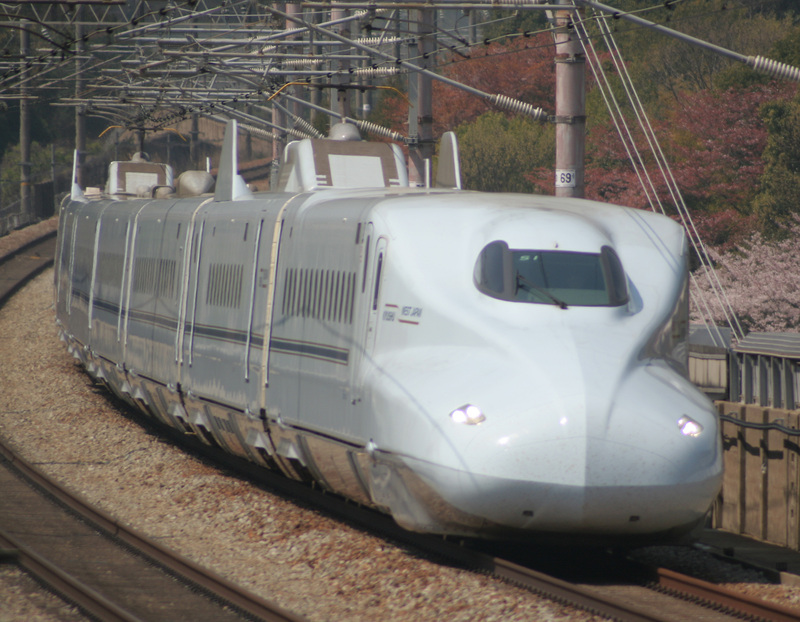 As probably you know, Kyushu Shinkansen will be opened all section between Hakata and Kagoshima-Chuo on Mar 12, 2011. JR Kyushu released the tentative schedule. You can see the timetable here(PDF). But this timetable is only in Japanese. So I made some sample timetable with Japanese-English translation. Before you take a look at the timetable, please click this image. This timetable consists of 4 page as PDF file. Each page has two directions. 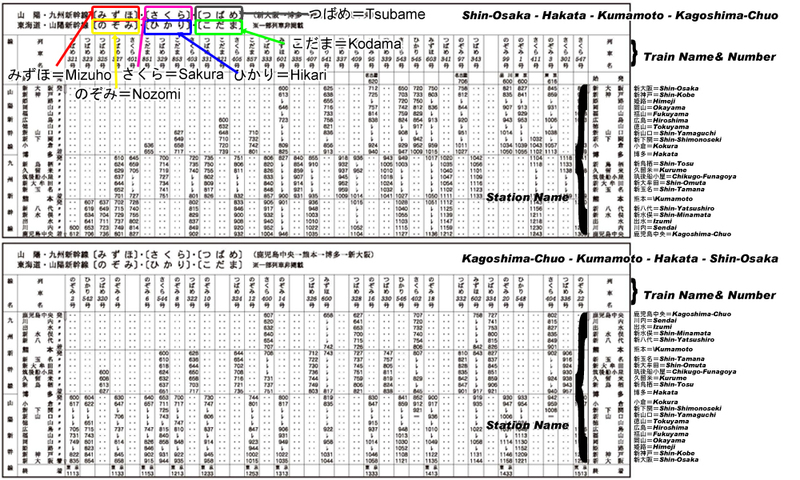 The top half of the page is the timetable for Shin-Osaka to Kagoshima-Chuo via Hiroshima, Hakata and Kumamoto. The bottom half is the timetable for Kagoshima-Chuo to Shin-Osaka via Kumamoto, Hakata and Hiroshima. N700 series will be used as Mizuho and Sakura. We will have four round trips for the fastest train, “Mizuho”. We will have Mizuho or Sakura mostly once an hour between Shin-Osaka and Kaghoshima-Chuo. It takes 3 hours and 46 minutes by Mizuho from Shin-Osaka to Kagoshima-Chuo. It takes about 4 hours to 4 hours 30 minutes by Sakura between Shin-Osaka and Hakata. We will have four departures an hour between Hakata and Kumamoto, and two departures between Hakata and Kagoshima-Chuo. Unfortunately JR Group did not announce anything about Japan Rail Pass validity to take these new trains, Mizuho and Sakura. I will let you know right after I get an information. This limited express train is one of most popular limited express train that is serviced by JR Kyushu. This connects Hakata and Kokura with Oita and Saeki. If you go to the popular hot springs resort, Beppu, this train is that you need to take after you get off Shinkansen at Kokura or Hakata. Of course this train is fully covered by Japan Rail Pass.